China has posted a surprise trade deficit in March as imports rose more-than-expected on stronger demand for commodities such as copper and oil. 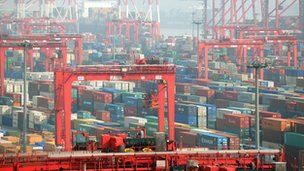 Analysts said the deficit may signal that domestic demand is picking up and China's attempts to move away from export-led growth were working. Imports surged 14% from a year earlier. Analysts were expecting a 5% increase. Exports only rose by 10%, leading to a $884m (£577m) deficit. There was a surplus of $15.3bn in February. 'Turning point' In recent years, China has relied heavily on its exports and investment spending to maintain a strong pace of growth. However, as economic growth in its key markets such as the US and Europe has slowed, exports have weakened. In the longer term, Beijing has said it wants to increase domestic demand and boost imports to reduce its dependence on exports and achieve more sustainable growth. Haibin Zhu, chief China economist at JP Morgan in Hong Kong, said March's figure may "suggest this cycle is probably coming to a turning point". "If domestic demand turns out to be stronger than expected, it's definitely positive for the economic outlook," he added. However, some analysts tempered the enthusiasm, saying trade data for China is unpredictable at the beginning of the year because of the Lunar New Year holiday when many factories shut down. Some observers have also questioned the accuracy of data coming out of China in recent months. They claim that official export data released by China sometimes does not match corresponding figures coming from its trading partners. "The 10% headline growth number masks an uncomfortable reality: either the trade data is unreliable, or if it is reliable, then what are being booked as exports are not actually exports," said Alistair Thornton, senior China economist at IHS Global Insight. Mr Thornton added that "there is plenty of anecdotal evidence to suggest that exporters are faking orders and 'round-tripping' in order to gain government export tax rebates". His views were echoed by Francis Lun, managing director of Lyncean Holdings in Hong Kong. "Chinese exporters may have over-reported their value to get export credit rebates because the figures in Hong Kong to and from China do not add up," Mr Lun claimed. Political pressure Analysts said that China's once-in-a-decade leadership change may have increased pressure on companies to report strong export figures. 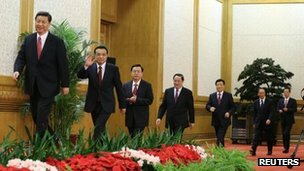 China, the world's second-largest economy, appointed a new President and Premier in March and the new leaders have taken over at a crucial time for the economy. Policymakers have been trying to spur a fresh wave of economic growth after the deepest downturn in the economy since the global financial crisis. "There may be a certain level of political pressure to get exporters to book future orders early, boosting year-on-year comparisons, on account of the once-a-decade transition," said Mr Thornton of IHS Global Insight. China's growth rate hit a 13-year low in 2012, and though there are signs of recovery, it is still seen as being a somewhat fragile rebound. At the same time, China has been grappling with a widening wealth gap, something that has prompted cases of social unrest and calls for the new leaders to create a long-lasting, sustainable and inclusive economic model.